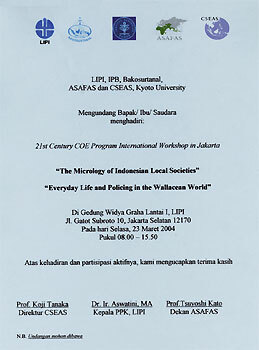 " By courtesy of Suara Pembaruan"
The first session intends to present and discuss the results of a research project carried out for three consecutive years from fiscal year 2001 until March 2004, receiving financial support from the Japan Society for the Promotion of Science (JSPS). This project aimed at affording a factual understanding of socio-cultural phenomena that emerged in Indonesian local societies after the implementation of the decentralization regulation. Our research area, however, covers only a minute part of Indonesia. In addition, many things in flux there are too elusive to identify. Notwithstanding these limitations, it is likely that we have not strived in vain. If microscopic attention is focused on details in a comparative perspective with the period of the New Order, it is not infeasible to collect substantial data on a few aspects of present-day Indonesian local societies. We would like to present interim analyses of those materials in order to invite your perceptive comments. We expect that this workshop will be a vital forum for exchanging views. The second session discusses the changing process of socio-economic and cultural life of peoples in the Wallacean maritime world. The Wallacean maritime world as considered here includes the southern part of the Philippines, Sabah, Malaysia and the eastern part of Indonesia. In the political sense, the Wallacean world was by the early twentieth century divided among three colonial states: the U.S. administered Philippines, British North Borneo and the Dutch East Indies. These regions now constitute parts of the Philippines, Malaysia and Indonesia respectively. Although the regions were and are situated at the administrative peripheries, the peoples there have had to constantly reorganize their everyday life as they have tried to deal with the interference of modern states. The papers in the session aim at understanding socio-economic and cultural dynamics in the Wallacean world in relation to the impacts brought on by enclosure of lands and seas by these modern states and by colonization or nationalization of peoples’ lives. We present tentative analyses of results of research conducted for three consecutive years, from fiscal year 2001 until March 2004, with financial support by a Grand-in-Aid for Scientific Research (A) from the Japan Society for the Promotion of Science (JSPS). "Adobe Acrobat Reader" (no charge) is required to look at a PDF file.